Part 1: the reform and survival of American public schools - an institutional perpective, James G. Cibulka; the new focus on institutions and the reinvention of schooling, Hanne B. Mawhinney; environmental adaption and selection - where are the parents and the public?, Ellen B.Goldring; "We have the right to be different" - educational community through a neoinstitutional lens, Mary Erina Driscoll; computer models on educational institutions - the case of vouchers and social equity, Terry M. Moe and Kenneth Shotts. Part 2: the second academic revolution, Gerald Grant and Christine Murray; the Wadleigh complex - a dream that soured, Mary Anne Raywid; intentional transformation in a small school district - the Turner school initiative, William B. Thomas, Kevin J. Moran and Jeremy Resnick; how the state should "break up" the big city district, Ted Kolderie; this time it's serious - post-idustrialism and the coming institutional change in education, Charles Taylor Kerchner and Joseph G. Weeres; the new institutionalism, the new science, persistance and change - the power of faith in schools, Rick Ginsberg. 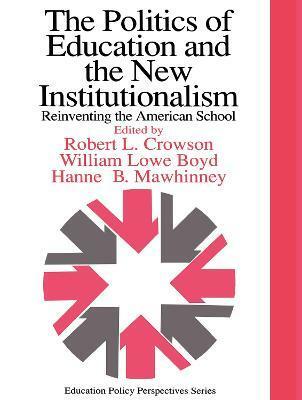 Part 3: institutional theory and the social structure of education, Douglas E. Mitchell; the new institutionalism in postmodern times - de-differentiation and the study of institutions, James Ryan; the politics of education, the new institutionalism and reinvented schooling - some concluding observations, Robert L. Crowson and William Lowe Boyd.